One of the best parts of our job here at Paste is getting to see so much live music, and 2016 did not disappoint by any stretch of the imagination. Whether it was a much-anticipated comeback or a high-energy performance from an enthusiastic newcomer, there was plenty to take in on the road this year. 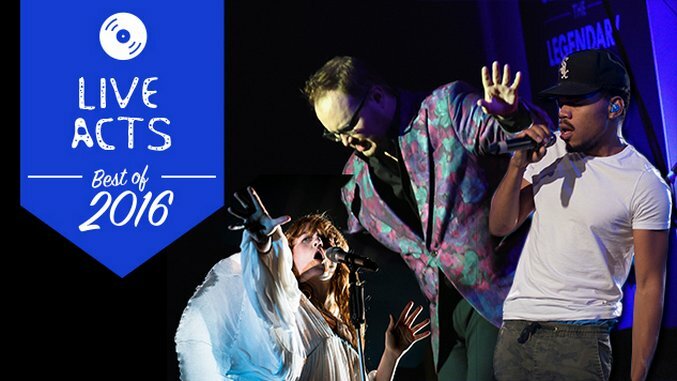 We polled our writers and editors and tallied the votes, and we present to you our picks for the 25 Best Live Acts of 2016. When we saw Prince at the Atlanta date of his Piano & A Microphone tour, we had no way of knowing that show would be his last, and after the singer’s tragic, untimely passing, 2016 will mostly be remembered as the garbage year that took the legendary Purple One from us, but it’s worth noting that the singer also played some incredible shows in his final months, stripping down his hits as well as some deep cuts and covers (including a stunning version of the recently departed David Bowie’s “Heroes”—seriously, 2016, enough) and getting behind the piano. Check out a clip from the Piano & A Microphone tour below, and for more live Prince video, click here. The Rolling Stones are always contenders for this list when they’re touring, but in 2016, it was their performances at two weekends of the Desert Trip festival in Indio, California that earned them votes. Their Night 1 headlining spot (during which they thanked the Nobel Prize-winning Bob Dylan for “opening” for them), set the tone for the rest of the once-in-a-lifetime festival, and a surprise cover of the Beatles’ “Come Together” even had Paul McCartney smiling and waving with approval from the VIP section. There is no other Top 40 artist whose live performance can come close to matching Beyoncé’s flawless vocals, choreography and command of the stage. Add to that her outstanding material from this year’s Lemonade—her best, most personal and most overtly political work to date—and you’ve got one hell of a show. When the majority of your songs go for the same vibe and tempo, it can sometimes be tough to hold the attention of a festival crowd full of more causal fans, but Savages never seem to have that problem. They keep crowds captivated, like at their Friday evening set on the Ponce de Leon stage at this year’s Shaky Knees festival. From the first notes to their set-ending “Fuckers” (in which frontwoman Jehnny Beth repeats “don’t let the fuckers get you down” like a life-affirming mantra), old fans and new ones alike were eager and receptive. Twin Peaks are extremely fun live, but still, no one at a Twin Peaks show ever seems to be having a better time than the band itself. They’re full of energy, and that joyfulness comes through in their music and infects everyone in the crowd. The Cure have 40 years of material to choose from, so it’s no surprise that they crafted some beautifully eclectic set lists in 2016, featuring some popular hits and deep cuts every night, for their first major North American tour since 2008. Frontman Robert Smith’s voice still sounds pristine—here’s hoping we don’t have to wait another eight years to see him next. Father John Misty is no stranger to this list—his shows have landed him on our Best Live Acts list for the second year in a row. 2015 saw FJM somehow bringing his live show to a new level with his I Love You, Honeybear material, shifting gears from stunningly gorgeous on “I Went to the Store One Day” to disaffected and funny as hell on “Bored in the USA” at the drop of a hat. In 2016, he did all of that and covered “Closer” by Nine Inch Nails, which he introduced as his “favorite love song.” With his recent revelation that a new album is finished, we can’t wait to see how he’ll top himself in 2017.